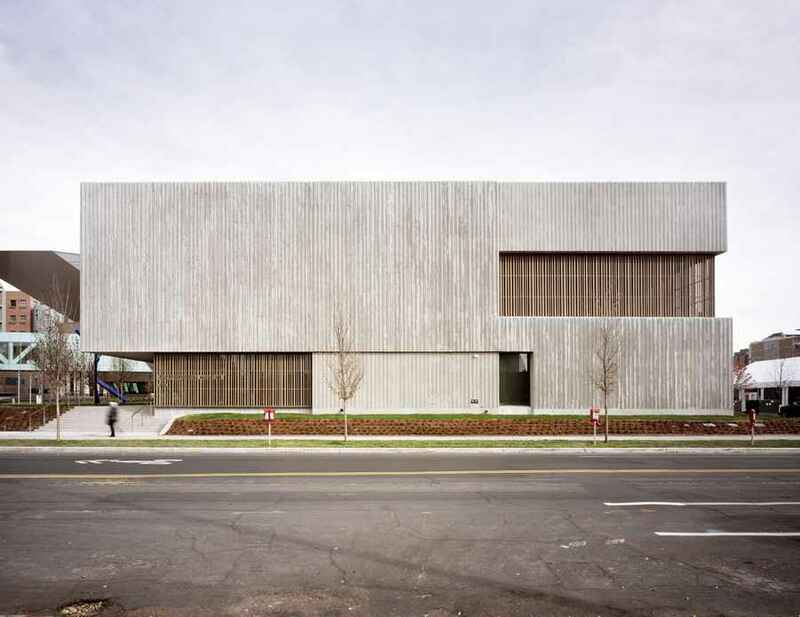 New York City – Following an international architecture competition in 2006, Allied Works was selected to design the single artist museum dedicated to the work of Clyfford Still. Opened to the public on November 18th, the museum houses 94% of Still’s total creative output, spanning nearly six decades of work. Allied Works’ design provides visitors with an intimate environment to experience the art of Clyfford Still. 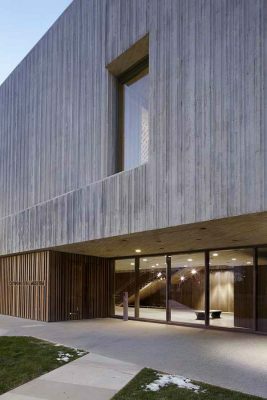 The Clyfford Still Museum building is a dense, cantilevered two-story building of richly worked concrete. Featuring nine light-filled galleries on its second level, as well as a library, educational and archival resources, a conservation studio, and collection storage on its first floor, the 28,500-square-foot museum creates a compelling environment in which to view and appreciate Still’s work and learn about his life and impact. One first encounters the museum through a grove of trees and landscaped forecourt, which provides a place of contemplation, decompression, and transition from the museum’s surrounding urban context. Through the trees, the structure of the building is visible, consisting of cast-in-place architectural concrete walls with a variety of surface relief and texture. The façade features thin, vertical lines of concrete that project from the building’s surface in a fractured, organic, and random pattern, creating a rich surface that changes in the intense Denver sunlight and forms varied shadows across the building. The entry is revealed beneath a canopy of trees, and visitors are welcomed into the museum by a low, long reception lobby. Visitors rise from the lobby and reception area toward the natural light falling from the galleries on the second floor. The museum’s second level features nine light-filled galleries, totaling approximately 10,000 square feet. Each gallery is distinctly defined and proportioned to respond to specific aspects and needs of the collection and helps trace the different phases of Still’s career in chronological sequence. Gallery heights vary to accommodate changes in scale and media; those with 18-foot-high ceilings showcase Still’s monumental Abstract Expressionist canvases, some of which extend to over 12 feet tall and 16 feet long, while smaller galleries with 11 • foot ceilings create a more intimate viewing environment for the presentation of smaller-scale paintings and works on paper. Two outdoor terraces and an education gallery offer visitors a moment of reflection and investigation during the gallery sequence, and allow them to re-orient themselves with the surrounding and distant landscape. Moving between galleries, visitors are provided glimpses down into the collection storage and interpretive galleries on the first level. Upon completing the primary gallery sequence, visitors may descend back to the museum’s first level to explore the painting storage, archive, and exhibition spaces viewable from above. 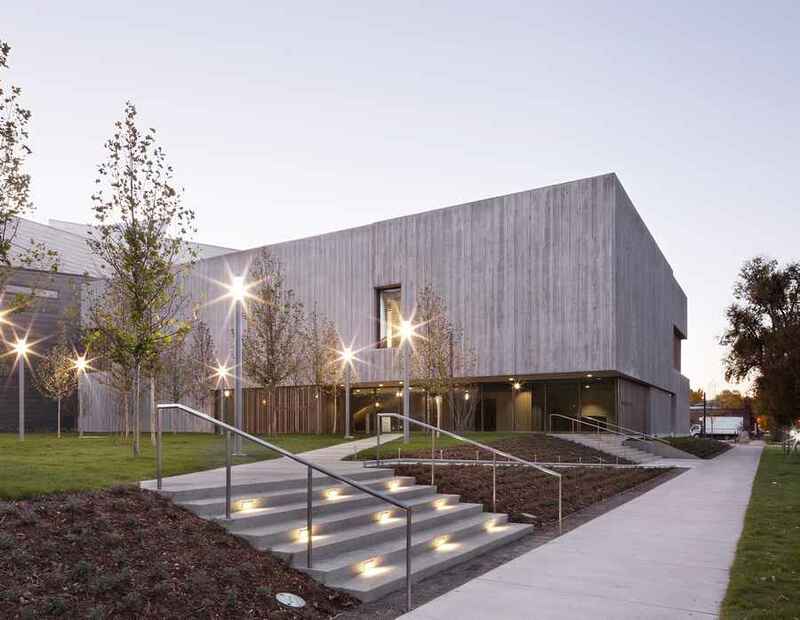 An open double-high corridor connects these facilities and serves as an exhibition hall allowing visitors to further their learning of the history and life of Clyfford Still. A “timeline” section of the corridor places the artist’s work in context with historic events and other artistic movements, and an “archive” hallway presents the everyday artifacts of the artist’s life and information about his painting technique and media. From this corridor, visitors are also able to view the collection storage rooms, and assess the number of paintings produced during the artist’s prolific career. A visible conservation lab and a research center offer visitors additional resources for furthering their knowledge of Still’s career. This open corridor speaks to the institution’s founding principle of unveiling this once-private and very personal collection to the public, as it invites a gradual immersion in the works of Still. 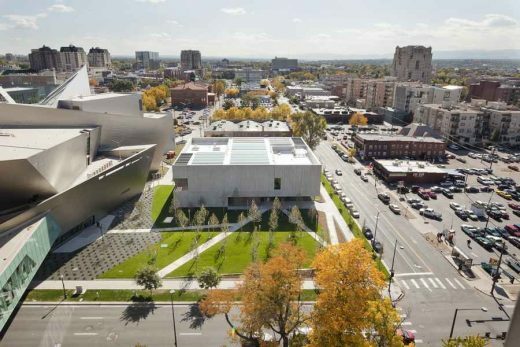 The Clyfford Still Museum was founded to promote public and scholarly understanding of the late artist’s work and legacy, through the presentation and preservation of the Clyfford Still and Patricia Still estates, donated to the City of Denver in 2004 and 2005 respectively, and totaling approximately 2,400 artworks. Considered one of the most important painters of the twentieth century, Still (1904 – 1980) was among the first generation of Abstract Expressionist artists who developed a new, powerful approach to painting in the years immediately following World War II. The Stills’ estates—now understood to contain 94 percent of the artist’s total output—as well as his extensive archive, have been sealed off from the public since 1980. Designed by Brad Cloepfil and Allied Works Architecture and located in Denver, Colorado, the new museum resides in the heart of the city’s Civic Center Cultural Complex, near the Denver Art Museum and its Daniel Libeskind-designed building, the Denver Public Library designed by Michael Graves, and History Colorado designed by David Tryba. For more information about the Clyfford Still Museum, please visit www.clyffordstillmuseum.org. Friday: Open until 8 p.m.